At least 15 people are reported to have been killed and dozens wounded in a series of air strikes on rebel-held areas in the Syrian city of Aleppo. Three medical facilities were hit in the space of three hours, the UN says. One of the hospitals targeted is one of the few that still provide paediatric services. Medics have had to take babies out of incubators, the UN says. Another strike hit near the Bayan hospital in the eastern Shaar district, activists and a monitoring group said. Video footage, purportedly of the aftermath, showed bodies being pulled from burning and destroyed buildings. It was not clear who was responsible, but government forces are trying to regain control of the divided city. In a statement, Unicef's Regional Director for the Middle East and North Africa Peter Salama said that the three medical facilities attacked were the al-Bayan and al-Hakim hospitals, and the Abdulhadi Fares clinic. All are in the eastern part of the city. "The Al Hakim hospital is one of the few that still provide paediatric services." Dr Salama said. "This is the second attack on the hospital." The UN says health personnel have also been either killed or injured. "Hundreds of medical facilities that provide critical life-saving health care for thousands have been damaged or destroyed. In the past two weeks alone, six health facilities were attacked across the country,." Dr Salama said. 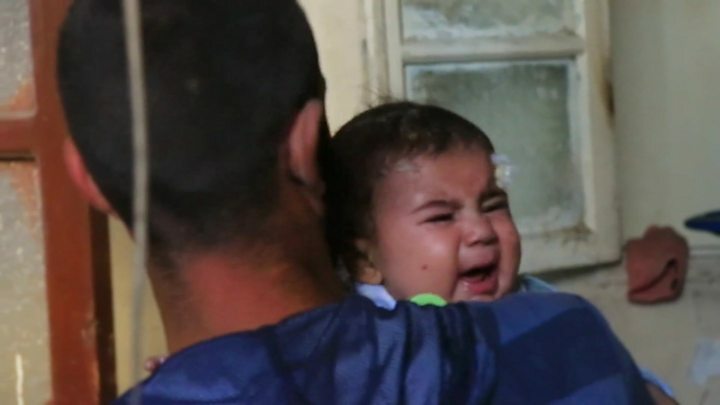 Nurses from al-Hakim were seen on Wednesday running to the hospital's basement carrying babies, the hospital's director of staff was quoted by the AP news agency as saying. Only a handful of hospitals are still functional in the city's rebel-held quarters, serving 350,000 residents, medics say. In a defiant speech on Tuesday, Syrian President Bashar al-Assad promised to retake "every inch" of the country from his opponents. Image caption Bashar al-Assad said he was determined to continue Syria's "war against terrorism"
The speech to Syria's newly-elected parliament was Mr Assad's first major address since UN-brokered indirect peace talks in Geneva broke down in April. Aleppo, once Syria's commercial and industrial hub, has been divided since 2012, with the government controlling the western half and rebel factions holding the east. But in recent months, government forces backed by Russian air strikes have almost encircled the rebel-held areas and cut off one of the rebels' two routes to Turkey. The battle for the city led to the collapse of a cessation of hostilities negotiated by Russia and the US at the end of February. The Russia supports the government and the US backs opposition forces seen as moderate. In a separate development, Syrian rebel forces recaptured several villages from so-called Islamic State (IS) north of Aleppo, the Syrian Observatory reported. IS militants seized the villages between the rebel-held towns of Marea and Azaz last month, cutting off a supply line to Turkey and forcing thousands of civilians to flee. On Wednesday morning, the militants reportedly withdrew to reinforce frontlines around the IS-held towns of Tabqa and Manbij, where government and US-backed Kurdish forces have launched offensives. The US-backed Kurdish-led Syrian Democratic Forces (SDF) was reported as saying on Wednesday evening that it had taken control of the eastern entrance of Manbij.